Every year around Christmastime, I start wanting to play with fire. I’m sure this goes back, as so much inevitably does, to my years as a young and enthusiastic Catholic. When I was an altar boy, my devout grandfather made sure I was always early for my shift, which meant I got to walk around the church with a long brass candle-lighter, stopping purposefully at every wax taper. And during the weeks of Advent, there were always so many more candles to light. For a 10-year-old, this was a dream job, even if it was unpaid; the perks included unrestricted access to matches. At Fort Defiance, my bar in Brooklyn, my love for Yuletide flame still burns. Every holiday office party that braves the damp harbor chill of Red Hook is treated to a bowl of flaming rum and brandy, from an impeccable recipe written by Charles Dickens, and introduced to me by David Wondrich in his book, Punch. Sometimes late on a Sunday night, I’ll fire one up just for kicks for some unsuspecting stragglers, or on one memorable night, for some off-duty bartenders who’d just come from touring the prodigious Christmas lights of Dyker Heights. Later, they introduced me to snapdragon, a Christmas game that dates to Elizabethan times. 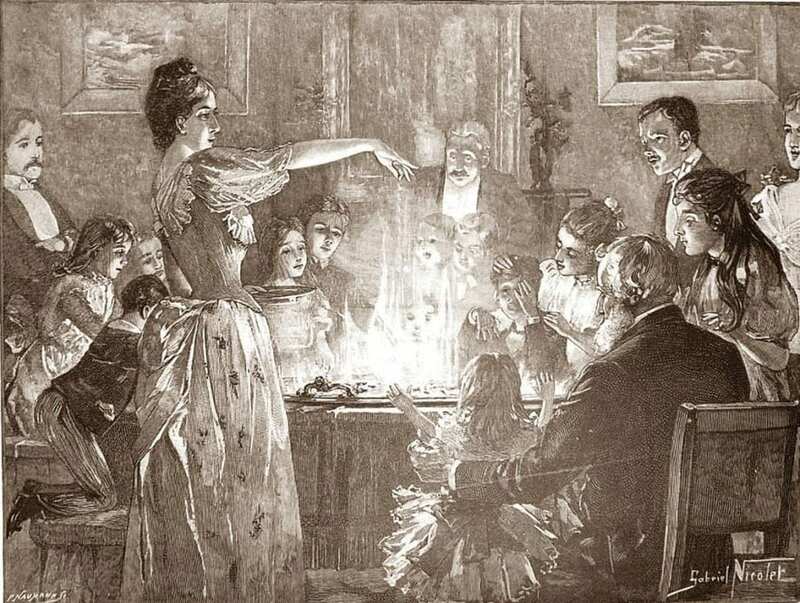 Children were encouraged to pluck raisins from a bowl of flaming brandy, “and eat them as hastily as they can, but rarely without burning their hands, or scalding their mouths,” according to one account. My inner altar boy was jealous of those kids, despite their oral injuries. What is it about fire and the holiday season? It’s all around us—the Yule log, the candles in the windows, the flames of the menorah that never go out, and a red-suited stranger who prefers chimneys to doors. And what instinct am I heeding when I stand like Dickens himself in front of that flaming bowl, ladle and tongs in hand? I signal the waiter to turn down the lights, and pour a trickle of flaming brandy down a spiral peel of lemon, studded with cloves. The blue flame slithers down the peel, the cloves glow red and sizzle, the guests gasp—I learned that trick by watching waiters light Café Brûlot Diabolique at Antoine’s in New Orleans, which they perform just before they draw a ring of fire right on your table. It’s old, this wintertime pyromania, and it runs deep in our collective psyche. Winter is a scary time, and always has been. The trees bare their bones; nights get longer; the sun spends less and less time in the sky. Will it return? The outcome becomes doubtful. The gates between our world and the unknown are pushed ajar at Halloween; they swing wide as the autumn weeks go by, and the world dims. “Night threatens day, just as the dead menace the living,” wrote Claude Lévi-Strauss in his essay “Father Christmas Executed.” In other words: The night is dark and full of terrors. But from the darkness comes a voice: “You don’t have to be afraid,” it says. “We have fire.” That’s always been our job—the priestesses, sorcerers, altar boys, bartenders and considerate hosts throughout the ages. When it feels like the world is going to end, we open our doors and welcome our guests, and tell them that life goes on. At the winter solstice, the sun god will be reborn. Days will lengthen, and everything will be put right. “And you know what?”—we tell them, as we pour them a drink—“Next year will be even better.” Sometimes all you need to do to convince them is light a fire. St. John Frizell is the drinks correspondent for Men's Journal and proprietor of Fort Defiance in Red Hook, Brooklyn. A simple but refreshing classic.